On October 28th, volunteers from across the country united for Make A Difference Day, one of the largest annual single-days of service nationwide. 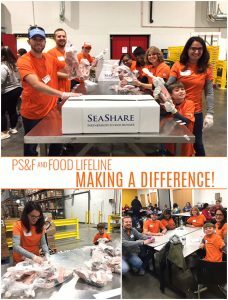 To celebrate and give back, the Parker, Smith & Feek employees volunteered at Food Lifeline to help pack and sort food items for distribution. By the end of their shift, along with the other volunteer groups, they had packed a total of 20,602 lbs of food. There’s a reason for the sore shoulders! Food Lifeline rescues millions of pounds of surplus food, that ends up in landfills, from farmers, manufacturers, grocery stores, and restaurants. Then they deliver this healthy and nutritious food to 275 food banks, shelters and meal programs across Western Washington. With generous volunteer support, they can provide 90,000 meals to the hungry every day. This, combined with their policy and advocacy work, helps to create a sustainable solution for ending hunger and truly making a difference.